Walt Disney Studios Motion Pictures Canada certainly is always at the thick of it when it comes to blockbuster releases and once again they do not disappoint as they unveil their upcoming slate of releases at their annual Holiday Preview. After the release of Ralph Breaks the Internet, a timeless beloved family movie gets a Sequel in Mary Poppins Returns. Emily Blunt and Hamilton’s Lin-Manuel Miranda star in this highly anticipated sequel featuring live-action and a throwback to the original animation style as well. Coming in 2019, we have two massive Marvel movies coming up, there is Captain Marvel starring the incomparable Brie Larson, which will be the big release that fills the audience in on a major character for Avengers 4. After Captain Marvel, we wrap-up phase three of the Avengers Saga with Avengers 4. After Thanos’ snap wiped-out half of the Avengers, the remaining Avengers have to stop Thanos and hopefully fix the damage he has done. Take us to May 2019 and we have the hotly-anticipated Sequel to Avengers: Infinity War, Avengers: We Still Don’t Know The Title Unfortunately. It is hard to hype-up a movie that made a record-breaking amount of money and has achieved all the success, but we all know that this final entry into phase three will be a game-changer. Tim Burton is back! Those words excite me more than they should, but Dumbo looks like it is going to be in the vein of typical Burton and that sounds absolutely incredible. The Trailer that dropped earlier last week speaks volumes to how gorgeous this newest Dumbo film will be and the Cast look incredible, it is however Darker but that is stylized like Burton’s other works. Artemis Fowl based on the best selling book series and Noelle are also coming out in 2019 from Walt Disney Studios Motion Pictures Canada. The Sequel to Frozen will also make its debut in late 2019, and that is not even the most shocking Sequel on this list. 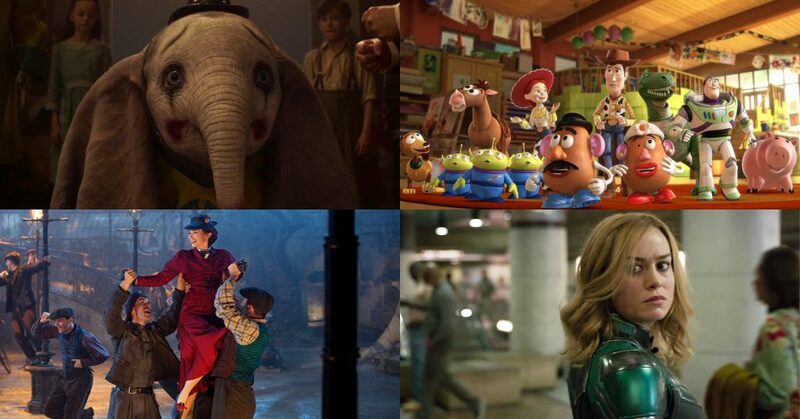 Toy Story 4 dropped two teaser Trailers, introducing a few new characters to the mix while also bringing back all of our favourite characters. Let me tell you June 21st, I will be sitting in a theatre watching Toy Story 4 multiple times and loving every second of life. Moreover, The Lion King is getting the live-action reboot with Jon Favreau at the helm, and if that doesn’t excite you then I don’t know what will! Disney also will be releasing the last entry into the Skywalker Saga, Star Wars Episode IX. There is literally nothing that needs to be said about this. It will shatter records, it will anger fans, people will cry, everyone is going to see it. Personally, I’m excited for a new saga, but am truly intrigued by how the Skywalker saga will conclude.